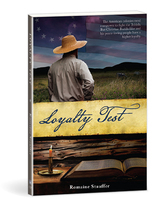 Christian watched uneasily as anti-British attitudes bubbled up in the American colonies. As rebellion progressed to outright war, Christian stood by as the new colonial army confiscated his wheat and cattle. But what would be the consequences of refusing to obey the new law requiring citizens to swear loyalty to the state? Based on historical characters, Loyalty Test describes the trials of a peaceful people in distressing times. A sequel to Hidden Riches.